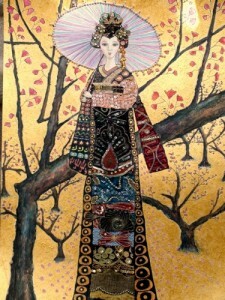 Hsiao-lin “Pearl” Chiang, RN, is a nurse at Matheny and a professional artist. From October 1-31, her paintings will be on display at the Bridgewater, NJ, Public Library. The exhibit, “Life Is Beautiful,” contains 30 paintings, but since the space available will only hold 10, Chiang will be changing the paintings twice during the month. Chiang moved to the United States from her native Taiwan in 1990. She has enjoyed painting since she was a child, and, while it was originally mostly an escape for her, it has turned into much more than that. Last fall, she had a 38-painting exhibit at the Art Yards Café in Taipei. For the past eight years, she has been teaching art to students, and recently she recruited a group of high school students to help her finish a mural, “Paradise,” in the Matheny children’s dining room. 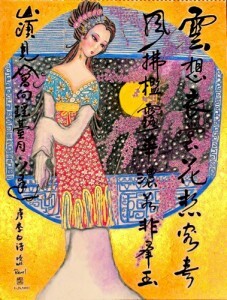 She also has her own website, www.pearlchiangarts.com. “I love to paint,” she says, “and I want to meet others who also love to paint or who might enjoy my colorful and happy paintings.” The Bridgewater Public Library is located at 1 Vogt Drive. Hours are Monday-Thursday, 9 a.m.-9 p.m.; Friday-Saturday, 9 a.m.-5 p.m.; Sunday, 1-5 p.m. For more information, call (908) 526-4016. This entry was posted in Uncategorized and tagged Hsiao-lin “Pearl” Chiang, Life is Beautiful. Bookmark the permalink.